SNELLVILLE, GA - October 2, 2008 - Shiloh Middle School PTA in Snellville honored renowned youth advocate, Al Duncan, for his commitment and devotion to serving young people. The PTA presented Mr. Duncan with the National PTA Life Achievement Award. 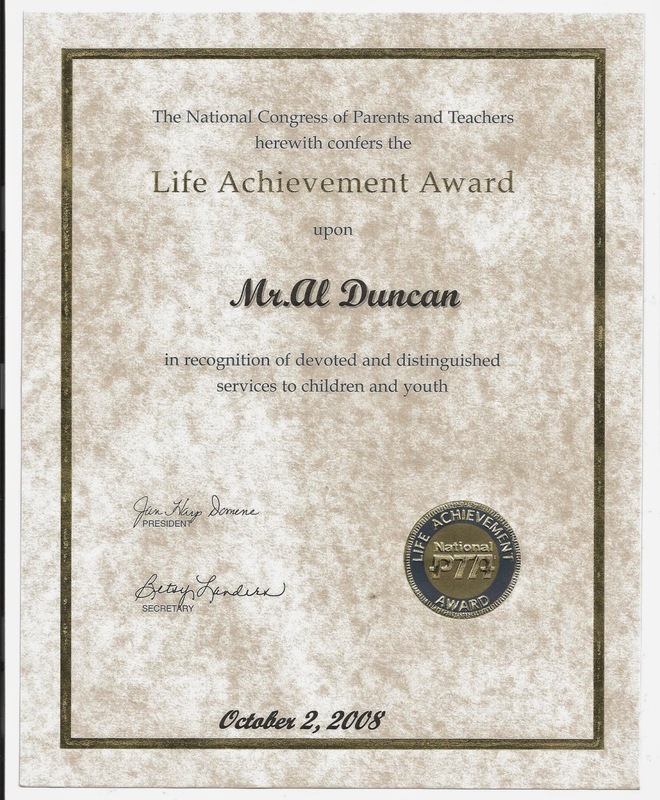 In addition to being a successful entrepreneur, author, and international soft skills trainer, Mr. Duncan has been a tireless advocate for youth for nearly a decade. He is a generous supporter of many youth serving organizations and is a recipient of The President's Call To Service Award which is only awarded to people with over 4,000 hours volunteer service. "PTA promotes the collaboration of families, schools, and communities throughout the country and encourages everyone who cares about kids to speak up with a powerful voice on their behalf, " said PTA National President Jan Harp Domene. "Al Duncan possesses a powerful message, and we cannot thank him enough for the work he has done and undoubtedly will continue to do." The National PTA Life Achievement Award is the highest honor a PTA can bestow. Formerly known as National PTA Life Membership, the award was established in 1899, just two years after PTA's founding, to pay tribute to those who had demonstrated exemplary service in support of children.